Meet Shruti Pandit Dandker from Sangli, Maharshtra, India. She has found the love of quilting and is trying to spread the word! Quilting is not common in India but judging by those who have joined the facebook page it is catching on! The article below was just published. Enjoy!! I am excited to share with you some of the quilts accepted into SAQA/CT's "Local Color". 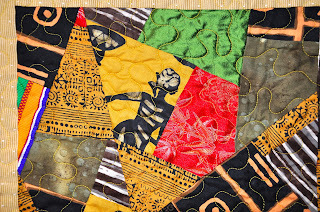 A small sample of quilts can be found on the sistersincloth blog. The show will be shown in Connecticut during 2013 in four venues. Check back again for the dates and locations for this wonderful art quilt exhibit! 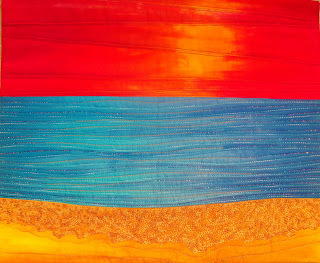 Here is a closeup of one of my quilts which was accepted. Here is my newest piece inspired by a postage stamp. The challenge was to create a piece using a postage stamp as an inspiration. I poured over many stamps and decided to create a textile piece inspired by the USPS series on Abstract Expressionists of the 1940's and 1950's. 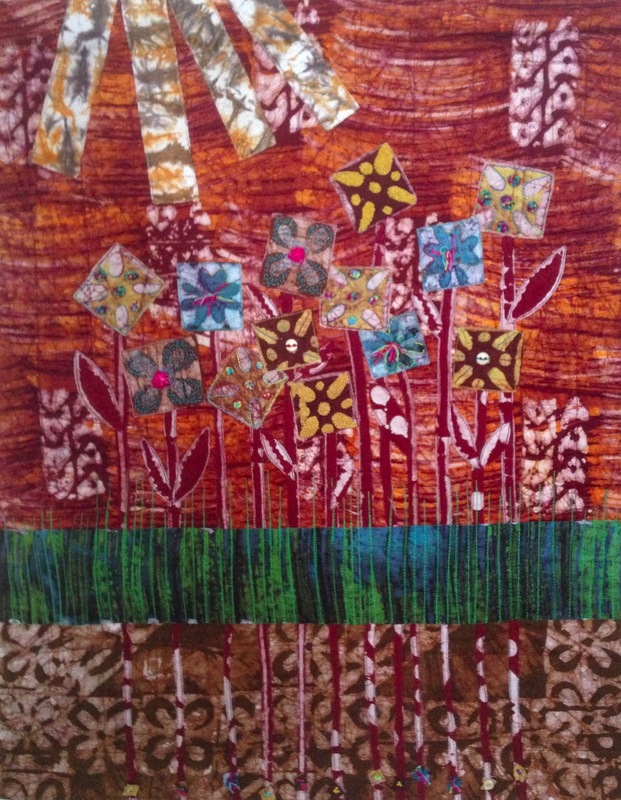 I created this piece with a package of batik strips, made in Ghana and purchased from Cultured Expressions. 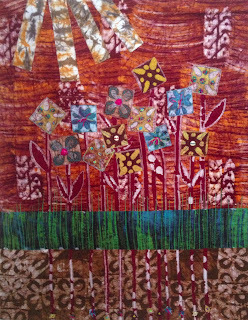 I inserted a small strip in cloth into a larger strip and then created the piece by using the Log Cabin pattern. I LOVE these batiks, I especially love the colors and the hand. This piece is hanging at the Guilford Library in Guilford, CT along with other pieces created by my fellow Sisters In Cloth. The exhibit will run until December 31, 2012. Please stop by. 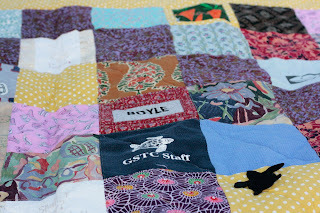 I recently designed and created a quilt using fabric sent to me by a bride and groom's family and friends. I didn't know what fabric I would receive and couldn't really design the quilt until all the pieces, swatches and yardage "spoke" to me. Hop on over the Sisters In Cloth blog to read more about this special wedding gift! WE'RE IN QUILTING ARTS MAGAZINE!!! Diane Wright a member of Sisters in Cloth shared some exciting news, FOUR members of our group are featured in the current Quilting Arts Gifts... AND our group (and a photo of a piece I created) is in the current Oct/Nov 2012 Quilting Arts magazine!Head over to http://sistersincloth.blogspot.com/ and to Diane's blog and check out all the exciting news!!!! Thanks to the quick action and hard work of Diane Cadrain, Impromptu Fibers, an exhibit of art quilters across the state is hanging at the CT Department of Transportation in Newington CT. Sixteen artists answered her call, with nine appearing with the collected pieces to hang the exhibit yesterday. Thank you to Diane Wright for putting this article on the Sisters in Cloth blog. 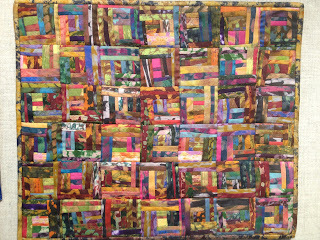 The exhibit is colorful and shows a wide range of techniques used by quilt art artists. Yesterday, Sisters in Cloth had their Extravaganza and we had a ball. Check out the photos of some of out latest creations. Words meant to be shared with the world. 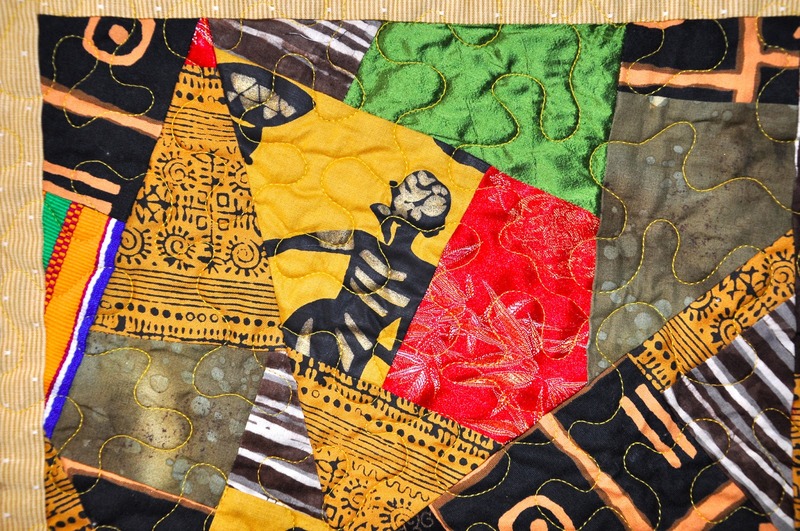 This congratulatory flag, made by Sisters in Cloth, is for Vivika Hansen DeNegre, The Prayer Flag Project founder AND newest Quilting Arts editor. If you haven't been to The Prayer Flag Project blog, go visit and think about some flags you can design and then share with the world! 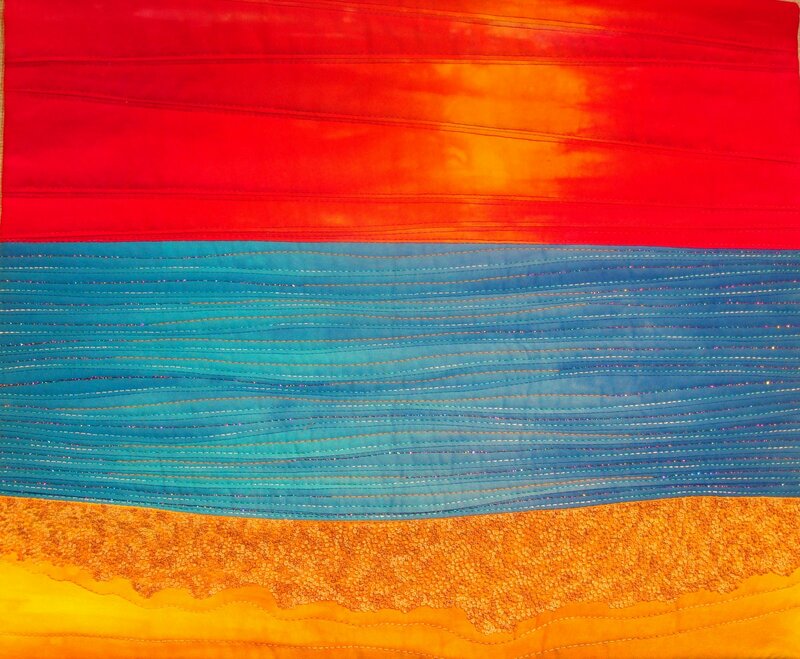 Just arrived; some gorgeous silks from India, sent by my daughter currently living in (and loving all things) Delhi. Stay tuned.... a piece will be designed, sewn, quilted and displayed right here very soon. Birds! Over the holiday break children at the Richmond Library learned to sew. Using felt, button and beads they created colorful, whimsical birds. Young artists at the Florence Griswold Museum in Old Lyme, CT crafted a beautiful flock of birds. Five first grade students learning to sew for the first time designed these beautiful birds. At the end of class, after the photo shoot, one young artist exclaimed to his new friends, "You know, I am a true artist!" Even though this piece has been posted before it just feels right again today. It is a beautiful summer day! Since April 4, my mind is focusing on a vocabulary which includes sacromere, origin and insertion points, quadratus lumborum and erector spinae. Add them to the Karvonen formula, BMR=RMR+PAL+TEF, acetycholine and sarcoplasmic reticulum and you get the idea I am studying and not sewing! Sensing a small frustration beginning to emerge as my creativity time is extremely limited my husband bought me a wonderful book for Easter; A Daily Creativity Journal, 365 Make Something Every Day and Change Your Life! by Noah Scalin. Day One: "make something that fits in the palm of your hand using only the material in your immediate environment." The eggs in my refrigerator were still white so on Easter Sunday I dyed my eggs in spinach, turmeric and coffee. Not my usual amount of creativity time but it felt good to "make" something pretty and do something other than study!